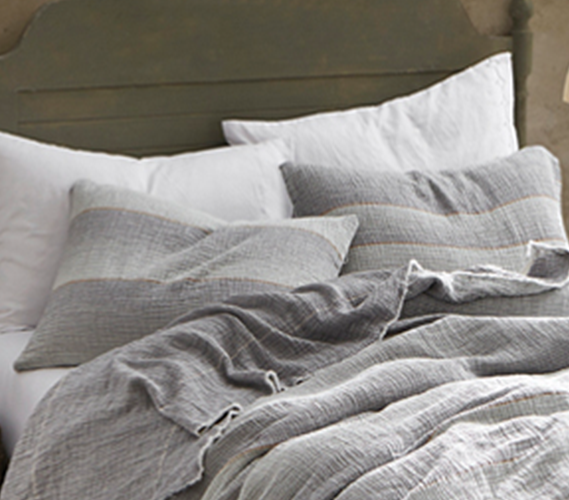 Comfort is key for the best dorm room bedding, so don't settle for less than what you want! But when you're shopping for your dorm essentials there are so many Twin XL bedding items to choose from to give you the most comfortable college bedding. Let's start you off easy with helping you choose the perfect standard sized pillow shams for your dorm room. Sitting at the head of your Twin XL size bed, your college pillow needs to be super cozy. And let's be honest, a little style never hurt either! Well, we have a standard pillow sham for your dorm pillow that gives you the best of both worlds. Our Rustica Portugal - Soft Denim Stone Washed Sham - Gray has a look and feel that you will absolutely love! Made with 100% cotton that is incredibly soft and comfy, this one of a kind standard sham will turn your Twin XL bedding pillow into an incredibly comfortable place for you to lay your head at night. This unique dorm pillow sham also helps increase the style of your college bedding and your dorm decor. Gray Twin XL bedding is so easy to match, even when it utilizes different shades of gray like this one-of-a-kind standard size college pillow sham!